Create a memorable and unforgettable experience for you and your loved one by arriving at your wedding in style and elegance with our exclusive wedding limo hire. It can accommodate up to 6 people which makes it a perfect car service for either a bridal or stag party. 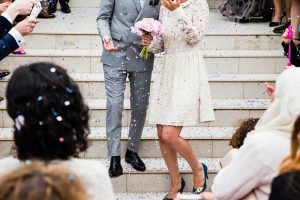 This limousine hire for weddings in London will also make the bride and the bridesmaid feel special and stunning when they arrive at the church and the reception. It is also the best service for the newly wed couple as they travel to the reception and to their honeymoon destination. The Excalibur limousine is the top choice for weddings. It is a combination of a traditional wedding vehicle and the contemporary style brought about by a white stretched limo. To highlight the big celebration, this vehicle can easily be decorated and accessorised with flowers and a just married sign. This vehicle has a spacious interior which makes it suitable for passengers wearing long wedding gowns. The seats are facing each other; therefore, the passengers get to enjoy a good conversation on their way to their destination. For more information about our wedding limo hire London, please feel free to call us now on 020 3006 2092 and talk to our customer services team.